The University of Birmingham is delighted to offer the Queen Elizabeth II international scholarships worth £7,000 towards tuition fees for a one year masters course to graduates of the Universitas 21 (U21) community. These scholarships are offered as a symbol of our commitment to the U21 network and the benefits of international educational co-operation. For information on living cost for the UK please visit the International student Advisory Service Visit official website. For a list of eligible U21 institutions please visit the U21 official website. 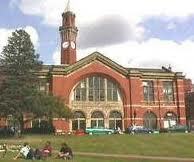 Demikianlah informasi tentang Queen Elizabeth II Scholarships, University of Birmingham, UK, semoga bermanfaat.